In a burnt-out, four-story shopping mall on the eastern outskirts of Baghdad, Iraq, one room blared with the raucous sounds of the ‘70s and ‘80s—Metallica, Boston, Blue Oyster Cult. American troops had occupied the Sha’ab Central Market, then known as the Forward Operating Base Callahan, in 2007, and from there, American soldiers were taking in the war one day at a time—patrolling the war zone streets, training local Iraqi police, sleeping in tuna can rooms. That day, they were playing Rock Band, Sergeant Christopher Jones said. He was there. He’d enlisted after 9/11 out in Baton Rouge, Louisiana, as a military policeman; six years later, he found himself in the desert with one PlayStation 3 and a platoon full of Rock Band fanatics. Jones is now back in the South, stationed at Fort Knox, Kentucky, where he’s heading the U.S. Army’s brand-new gamer recruitment initiative, Army Esports, which began its slow roll-out in September. Over the phone recently, Jones reminisced about the bonds he’d forged with Army comrades through gaming. Some nights in Kuwait, soldiers fired up one of the Xbox 360s the Army’s Family and Morale, Welfare and Recreation division landed and, in rooms of 20-plus, took turns competing in the low gravity of Halo 3’s science-fiction ringworlds. Other nights, Jones would hole up with his buddy who’d bravely brought along his PlayStation 3 to play the action fantasy game The Elder Scrolls IV: Oblivion. Later, Rock Band would be a revelation. In full combat equipment and a Rock Band guitar, Jones would knee-slide across the base’s floor, he fondly recalled. It’s like a short, happy sequence in an otherwise grim war movie—and also a little like a well-cut video sequence from a television ad for the Army, acted out by chiseled-faced actors. Jones is in recruitment, and he’s confident that gaming is the next frontier for it. He’s leading the Army’s fresh recruitment effort to send active or reserve soldiers who are high-level gamers to esports tournaments around the country. It’s not hard to be won over by his earnestness, and easy to forget that these stories—with all the ugliness of war skimmed off—are very targeted sales pitches. Launched in September, Army Esports is in the early stages of fielding teams for top games like Tekken 7, League of Legends, Overwatch, Fortnite, and even Street Fighter V. At tournaments like EVO, esports pros or fans might have a chance encounter with an enlisted soldier, who would, Staff Sergeant Ryan Meaux, a recruiter who is helping run Army Esports, said in Reddit AMA,“be in a support role to help young people see Soldiers in a different light and understand the many different roles people can have in the Army.” It makes sense, Jones explained, to mix soldiers with competitive-minded, strategically-inclined gamers who know all about teamthink (at least, over voice chat). At a time when there’s a gaping cultural maw separating U.S. civilians and the U.S. military armed forces, Jones said, gaming could be a binding fiber, or, thinking bigger, the pool everyone is swimming in. Esports isn’t it for Army Esports. There will be Twitch streams; there will be some sort of esports facility out at Fort Knox, Kentucky; and there will be two 18-wheeler trailers full of modern gaming consoles. Army Esports will be a thing, and if it’s anything like the Department of Defense’s past forays into the wild world of video games, it just might work. This is a neat bit of branding in that it poses the new initiative as a forward-looking plan meant to address a contemporary problem, which it is, so far as it goes. After all, 60% of Americans play video games every day, according to a 2018 report from the Entertainment Software Association, and the younger someone is, the likelier they are to be a gamer. 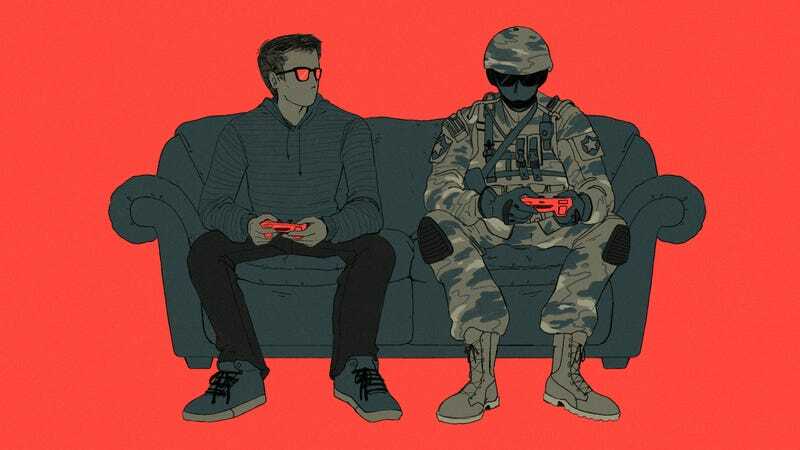 Eighty-five percent of the Army is made up of men, who are also likelier to be gamers, and of those enlisted, two-thirds are between 18 and 29. Positioning the Army as a game-friendly environment and institution is crucial, or even necessary, to reach the people the Army wants to reach. What the pitch omits, though, is that video games and the U.S. armed forces have been entwined ever since the commercial rise of gaming. 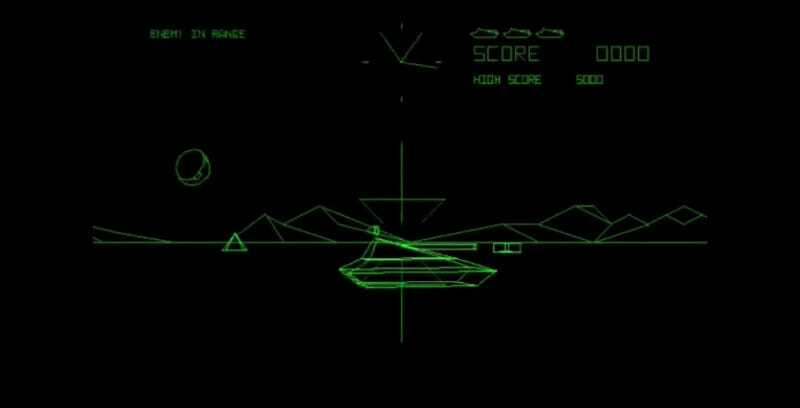 In the 1980s, Atari released the tank shooter Battlezone, which the Army’s Training and Doctrine Command latched onto as a potential training tool. They asked Atari to modify Battlezone for that purpose, which they did, and it became Army Battlezone, also known as Bradley Trainer. The same thing happened to the seminal PC shooter Doom. Around the time the game was released in 1993, the General Officers Symposium tasked the Marine Corps Modeling and Simulation Office with scouring for popular, commercial games they could repurpose for training. Two years later, the Marines’ Modeling and Simulation Office transformed Doom into a military fire-team simulation. “The martian terrain and alien demons of the original Doom were replaced by a dun-colored landscape of pockmarked concrete bunkers and enemies who had been drawn from scans of GI Joe action figures,” reads War Play, a book about the history of the Army’s involvement with games. The game was Marine Doom. Its purpose, the book continues, “was to teach Marines not how to fire their weapons but how to work together in teams and make split-second decisions in the midst of combat.” Now, these types of shooters are big business, making up over a quarter of game sales. Military themes saturate the genre, which by its nature depicts a highly stylized version of the military life—little bureaucracy and worry about logistics, and a great deal of shooting—and generally strives to be as inoffensive as possible, rarely questioning the political ends for which all that shooting is done, and whenever possible swapping in Nazis or other unobjectionable enemies for those real soldiers fight. There’s a narrative that the inception of online, team-based shooter games carved out a pipeline from gamer to soldier; players whose palates were whetted by first-person shooter Call of Duty’s gunplay might, the theory goes, hunger for the real thing. In articles titled “Is America’s Army a video game, a recruitment device, or a violence-training tool?” and “Army Recruits Teens With Internet Game,” local and national media publications rode the wave of skepticism and, sometimes, fury over this newly-forged connection between play-digital and physical violence. Yes, there was easily-dismissed parental hand-wringing over early-2000s first-person shooters; there were also legitimate concerns that gamifying the ugliness of war might glamorize a line of work that has a high rate of PTSD and trauma. Reality is a little more complicated, but not much more. America’s Army was a winner. It cost .33 percent of the Army’s marketing budget ($7.5 million), but according to War Play, 20 percent of incoming West Point trainees had played it. A 2008 MIT study claimed that America’s Army had positively influenced 30% of young civilians’ views on the Army. U.S. Army Esports’ Street Fighter competition. Now, as a recruiter, Jones had this idea: “The idea is to find soldiers at the competitive level and send them to tournaments like EVO.” That’s the biggest tournament in fighting games, which in 2018 had about 10,000 registered players and, at one point, 258,000 concurrent viewers. Army Esports already hosted a Street Fighter V tournament, open to all active-duty Army men and women. Soon, at tournaments across the country, enlisted, reserve and veteran soldiers will be available to answer questions; to “bridge the gap.” Meaux pointed out that the primary market for games are people between ages 17-34, and, several times, cited the statistic that 50 percent of Americans don’t know anything about the U.S. Army. Recruitment is a multi-layered thing, though. There isn’t always a pitch. Sometimes, recruitment is about making a mental or emotional connection. Other times, it’s about offering a resource, a vehicle for information. Army Esports intends to do it all. Some aspects seem obviously grabby, like Jones’ pronouncement that, since esports pros make pitiable or inconsistent wages, Army Esports would be “a unique opportunity because soldiers are already salaried. Then they essentially get to live their dream and play games for the U.S. Army.” Other aspects may feel more hands-off, like the simple act of making enlisted soldiers more available to the public in a fun, competitive zone. The Army’s top-level gamers are not recruiters; Sergrants Meaux and Jones are. The gamers, in Sergeant Meaux’s words, will attend tournaments “in support of the recruiting effort.” The Twitch channel is Twitch.TV/ArmyEntertainment. Then there are the trucks. Jones has a lot of starry-eyed stories about brotherhood, the Army, and gaming’s power as a social fiber, like when he was sitting by himself somewhere in Iraq when he heard an infantryman beside him talking about his Retribution Paladin in World of Warcraft. “I turned around and was like, ‘Hey, Ret is doing pretty crappy.” That got them talking about potential nerfs, the state of the game, he said with some nostalgia. In our interview, Jones wheeled out this example to show that, in the Army, gamers can find their kin. The world isn’t exactly an unfriendly place for the enormous contingent of people with enough expendable income to purchase games, to be sure, but after decades of a perceived cultural stigma against gamers, this kind of rhetoric might be the sword with which the Army slays its recruitment deficit, or at least the stone on which it sharpens it. Listening to Jones, it was easy to get swept up in it all. Questions came to mind—Was it propaganda, or was it his earnest view? Does an earnest view, when packaged, refined, and weaponized, become the propaganda?—but they seemed abstract next to the specificity of what he was saying. He swerved the conversation into a speech about how, today, Americans misunderstand who’s in the Army—what they do, what they’re like. People assume he played football in high school. No so, he says. In high school, Jones loved comic books—Marvel before DC—anime, video games, and The Legend of Zelda in particular.